Its been a long since I posted anything on this page. Sorry for not being able to devote as much time as I would like to. Sometimes things that you love have to take a back seat making space for things which need your urgent intervention. I totally understand sometimes life is not easy on us and with time I have learnt to be patient and take things as it comes. But I must say am immensely fortunate to connect to some bloggers and some friends that I made through my blog. Who kept on mailing and messaging me asking for my where abouts. Am touched and truly consider myself blessed to have such well wishers and friends around me. The recipe that am sharing today is my father’s. He is the ‘Khichuri man’ of our family and gets a call from everyone when the monsoon announces its arrival. He has some real good khichuri recipes in his repertoire and this left over rice khichuri is one of them. Every time there is a sudden down pore in the city we request him to make this. 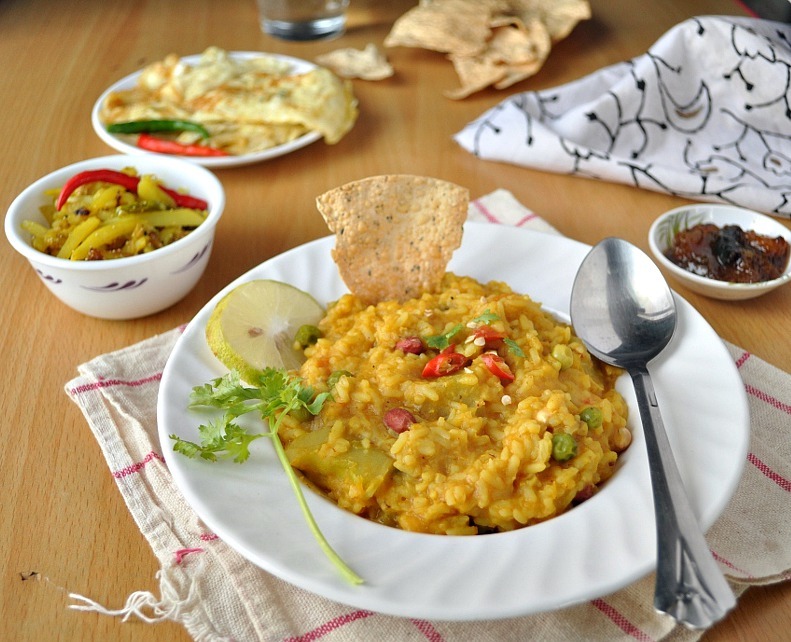 This spicy khichuri goes really well with Bengali style alu bhaja (potato fry) and omlette. Rain or no rain sometimes you got to try this. Wash the red lentil under running water and soak for 10-15 minutes. Peel potatoes and cut in cubes. Chop the onions and keep aside. Dry roast the peanuts till they crisp up. Keep aside. Heat the oil and lightly sauté the potatoes with a pinch of salt. Drain and keep aside. In the same oil add lightly crushed cinnamon, cloves, peppercorns. Let them splutter. Add chopped onion and fry on medium with a pinch of salt till they turn golden in colour. Mix ginger paste with turmeric, chili and coriander powder with 2 tbsp water and add to the onion. Sauté till they are cooked and the raw smell is gone now add the lentil and fry on medium till they turn white. Add the rice mix and now add 3 cups of warm water. Cut the tomato in quarters and add with the potatoes. Cover and let it cook on low flame. Keep stirring in between. After 10 minutes or so add 2 more cups of water and salt as per taste. Cover and cook it till the potatoes are cooked and the dal is fully boiled. Approx. 8-10 more minutes. Add the peas and and cook for 2-3 minues. Finish with the scraped coconut, garam masala powder little sugar and the toasted peanuts. Mix and adjust the seasoning. Serve hot with ghee (clarified butter) drizzled on top. Beat an egg with salt, chopped onion and chopped green chillies. You can also add chopped coriander leaves if you wish. Heat a non stick pan or a kadhai. Pour ½ tsp oil. Once the oil is hot rotate the pan to coat the inside well. Pour the beaten egg and tilt the pan to spread and cover the pan. Within a minute the top will set. Then with the help of a spatula fold the omlette in 3. Take out and serve right away. Try using mix of various lentils for more flavour. You can also add other vegetables like beans, carrots and cauliflowers. I recently have started adding quartered onions or whole shallots along with chopped onions in the khichuri. This lends an amazing aroma. to healthy food for healthy kids: combo meal at Nivedhanam. Originally started by Nithu Bala. JCO: Monsoon of India hosted at my place this month. the theme is started by Jagruti. khichri, khichri recipe, khichri recipes, khichuri, bengali khichuri recipe, niramish khichuri, bhoger khichuri recipe, seddho chaler khichuri recipes, bhater khichuri recipes, how to make quick khichri, quick khichri recipe, masoor dal khichri, musur daler khicuri recipe, spicy khichri recipe.omlette recipe, how to make omlette, how to make indian khichri, easiest khichri recipe, what to do with left over rice, cooked rice recipe, indian omlette recipe. 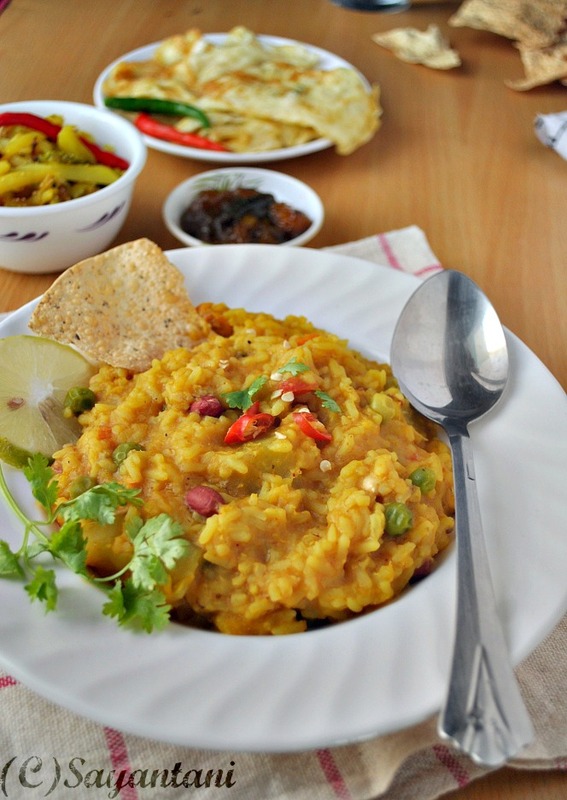 Love this spicy khichuri. A drizzle of ghee and I can wolf down that plate. Am generally not a big fan of rice items buut your pics make me want to go head on and polish off that plate with the omlette! tomar blogta aweosme.tumi pls kokatar kothai gourmet items bhalo pao jai aktu update koro.-rajasree. Khichuri r dimer omelette....with drizzling little ghee on the top, sathe abar papad bhaja o royeche. Lov samlano jachhe na......really. This khichri sounds so unique, great way to use leftover rice! Yummy pics! Kichri sounds very yummy . I will try this soon. Keep writing more recipes dear. 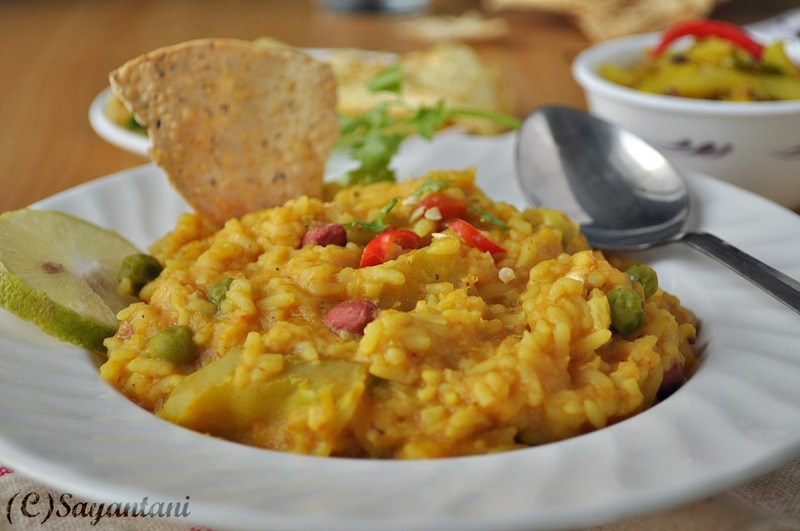 My favorite comfort food..love a bowl of hot Khichdi during winter days. Lovely click, Sayantani! Hope things are fine now and little R is better...That looks like such perfect comfort food ! Thanks for sending this yummy recipe to my event.. Please add the logo and the link to Nithu's page - both are mandatory!!! Looking forward for more great recipes!!! This spread makes me happy,wat a comforting food. 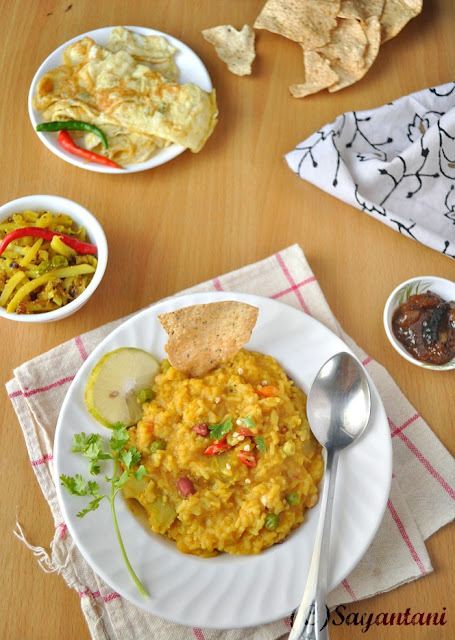 That is such an inviting and comforting dish...Love the spread you made with omellete as well. Love Indian recipes! Will have to try this one! I made khichri yesterday but replaced rice with barley. They were so good. I am going to try your recipe with barley soon. Lovely pictures.